Lately I’ve been thinking about how I really want to improve talk throughout my workshop time. 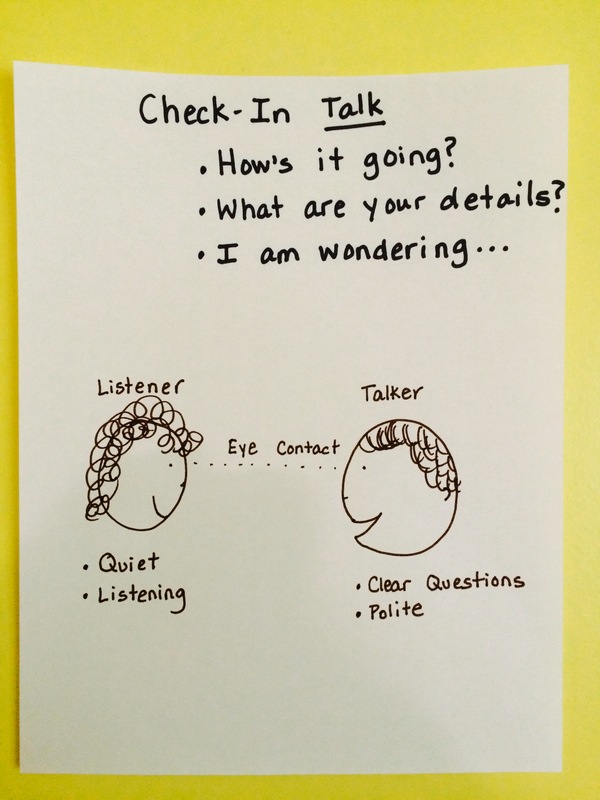 Talking at the beginning and end of workshop are so important, but I really want to put a focus on setting aside time for peers to check in with each other consistently and not just on the fly, but with intention. Here is my plan to make that happen. 1. Set up a safe environment. This may feel like an obvious one, but it is still at the top of my list. We have to remember that students will only share when they feel they are in an environment that cares about what they have to say. 2. Create a chart together outlining expectations. 3. Set aside a sacred space. I’d like to have a special spot in the room for this partner check-in to take place. A sacred spot in the room that students can go when they need a sounding board or a fresh ear. I want to be sure that the partner check-in is flexible while not interfering with the process. I hope students will be able to flex in and out of the space with refreshed ideas. I plan on showing this video of a peer conference to give students an idea of what a partner check-in might sound like. This example shows the back and forth conversation between two students while they are in the middle of a piece of writing. Do you allow students to check in with peers during the writing process? What types of procedures have you put in place to make it successful? I hope you will think about trying to incorporate more talk throughout the workshop to encourage thinking and reflection as students work through a piece. I’ll be presenting at Byron Center’s Literacy Conference in Michigan August 11-12! Will I see you? It should be a wonderful conference and a great opportunity to connect and collaborate! Update: Here is the flyer for the conference. I believe you can register onsite, but I am not positive. Hi Betsy. What is the Byron Center Literacy Conference? I’m in Michigan and would like to know about it. I googled and could find Byron Center, but not a literacy conference. Would love to attend if possible. Thanks. I updated the post and added a link to the flyer, Kathleen. Hope this helps! Would love to meet you. I’m not positive that you can register onsite, but I would assume so. Good luck at your presentation! I’m sure you will do great. I want to do more work with partnerships this year with my third graders. I also love the idea of a special spot for partners to go, but am worried about the management of it. Would kids have to sign up for time there? How would I monitor how long they stay in that spot to give other kids a turn and not take up too much writing time? Would love to know how others have worked through this. Thanks for a great post, Betsy! Betsy, this was WONDERFUL! I love that you included a video clip of just what partner check-ins might look like. I might just show that to my kiddos. On your other note – I wish I could attend the Byron Center Lit Conference this week – I live just down the road. Unfortunately, I am on vacation in northern Michigan this very week. I hope you video tape yourself!